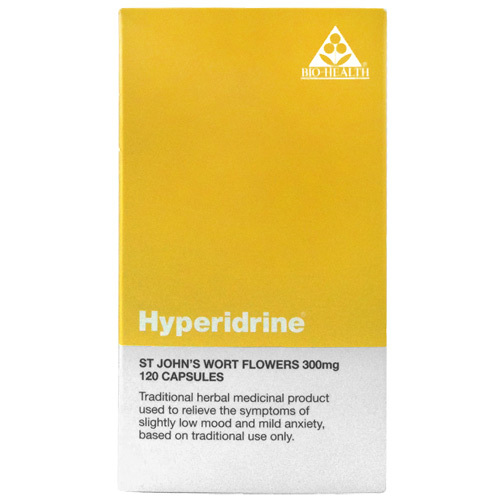 Bio Health Hyperidrine (St Johns Wort) is a traditional herbal medicinal product used to relieve the symptoms of slightly low mood and mild anxiety. 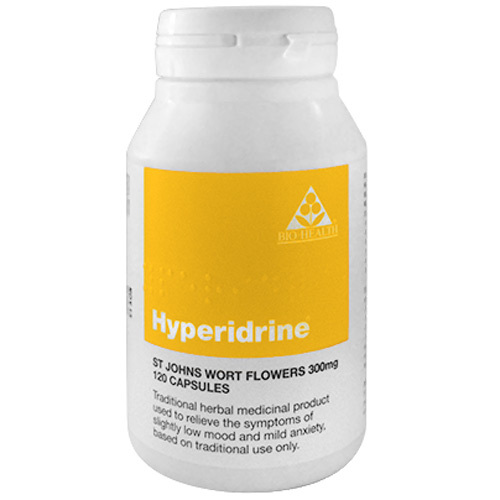 While it was previously thought the benefits of St. John’s wort were due to hypericin, other constituents have now come into play such as hyperforin, and flavonoids. Please read leaflet carefully before using Hyperidrine. It contains important information about this medicine. St John`s Wort, Hypromellose (Capsule shell). This capsule shell is made from hypromellose. Take 1 capsule up to 3 times a day swallowed with water. Can be used by children 15 years and above. St John`s Wort can affect the way some medicines work and reduce thier effectiveness. Medicines that can be affected by St John`s Wort include prescription medicines and those that you may have bought yourself without a prescription. you are suffering from depression. your skin is exceptionally sensitive to sunlight (photosensitive). you are having light treatment (phototherapy) for any condition. People with a history of manic-depressive illness (bipolar disorder) or a less severe condition known as hypomania, should avoid use of St. John`s wort as it may trigger a manic episode. BEFORE TAKING THIS PRODUCT: Check with you doctor or pharmacist if you are taking any prescribed medicines as St. John`s Wort may affect the way they work. 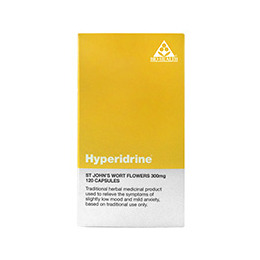 Below are reviews of Hyperidrine St Johns Wort - 120 x 300mg Capsules by bodykind customers. If you have tried this product we'd love to hear what you think so please leave a review. This is a very high quality filler free product, I carried out lots of research before hand as I am very particular with what goes into supplements. This is just the herbal extract and an inert cellulose capsule. It is also a brand which has the THR (Traditional Herbal Registration) to meet standards set by the Traditional Herbal Medicinal Products Directive. You can look this up online for further info. I don't think it would be helpful to leave a review on how the herb worked for me as people can ultimately be very unique in how they respond to both pharmaceutical or herbal medicines. Clinical trails show effectiveness at 900 mg (300 mg 3 x p/d) I began with 300 mg once per day and had effects from that. I would recommend finding what works for you and to keep in mind that people can respond differently even if experiencing the same symptoms. I highly recommend this product for its quality and purity, as for effectiveness and potency, this will be dependent on the individual's response. Bio Health Hyperidrine (St Johns Wort) is a traditional herbal medicinal product used to relieve the symptoms of slightly low mood and mild anxiety based on traditional use only.